What is the currency and exchange rate in Ireland? Ireland uses the EURO as currency. What is the currency and exchange rate in England, Scotland, Wales, and No. Ireland? Great Britain uses the British Pound. When do you convert money? You may exchange currency at the airport upon our arrival. Hotels and banks throughout Ireland will convert American currency to Euros for a modest fee per transaction. Your ATM card will also work in Ireland. You will receive the best exchange rates when using your ATM card. Purchasers may also use American Express, VISA, and MasterCard. Yes, you need a valid passport to travel to Ireland. It is advisable for you to visit your local U.S. Post Office to obtain the application, as it takes several weeks for processing. You will need a photo ID, such as a drivers license, and an original certified birth certificate, as well as two photos (many post offices offer this service) along with the completed application form. 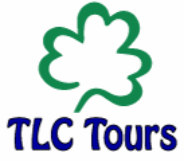 It is customary to tip your Irish Tour Guide/ Driver $5.00-$6.00 per person per day, each. Do you need an electrical converter? Converters are required for items requiring electrical power such as curling irons, battery rechargers, hairdryers, and electric shavers. Most hotels have hair dryers in the rooms (look in the drawers…they aren’t in the bathroom!). Converters are available at retailers such as Walmart, Staples, Office Max, Office Depot, K-Mart, or any travel specialty store. What about "Land Only" travelers? Those travelers who are not at the airport with the group on arrival ("land only" travelers) are responsible for getting themselves to our first hotel. Is being punctual all that important? A mere five-minute delay each time we load the coach will amount to hours before the week is over. Please make every effort to be on time. Can you buy trip insurance? Yes. Trip insurance is available. The specifics of the coverage are available in writing on request. Is beer served warm in Ireland? No. It is normally served cold. Is there a pool at our hotel? Many of our hotels have pools. It is best to inquire once we have our hotels confirmed. Can we have 3 or 4 in a room?